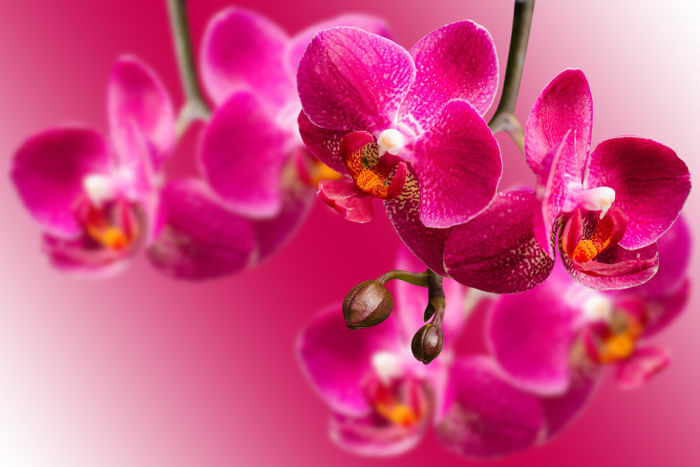 Cat-Friendly Plants Ideas: Orchid have seen as a symbol of love, luxury and beauty. It looks like butterflies are flying around in the air in an elegant manner. They can come in many colors and sizes, let’s find your own one and enjoy its noble beauty along with cats! The Aztecs were known to drink a mixture of vanilla orchid flowers and chocolate to give them strength. They cultivated the seed pods of them, which is the only variety that produces an edible fruit, as flavoring (vanilla extract) which has since become the most popular flavorings in the world. The Victorians were so mystified by the orchid’s irresistible beauty that they collected and displayed them like treasures. Scientifically, biologist Charles Darwin wrote volumes on them and their pollination. Angraecum sesquipedale from Madagascar is sometimes called Darwin’s Orchid because he posited from its composition that a specific moth must exist with an unprecedented 13 inch long proboscis in order to pollinate it. In traditional Chinese medicine, it was used to help cure coughs and lung illnesses. And at the time of Confucius, called them The Plant of the King’s Fragrance . In ancient Greece, they were associated with virility and male fertility, the belief being that if women ate its flowers, they would bear a son to continue the family tradition, therefore used in love potion as aphrodisiacs. Care of indoor ones are easy once you learn how to grow them properly. These unique-shaped flowers can be found in a range of colors and sizes depending on the variety. They need ample water, but should be allowed to dry out some between waterings as most plants do so. Most of them require moist, well-draining conditions. Also, they need adequate humidity, about 50 to 70 percent. You can place a tray of pebbles beneath them, mist them daily, or use a humidifier. Orchid requires shallow planting. Place it in an east to south-facing window or room. They prefer bright, indirect light. Insufficient light results in poor flowering. Never put them in the direct sun, which would scorch leaves. While it tolerates cooler or warmer temperatures throughout their norming growing season, they need to be about 15 degrees cooler at night than during the day in order to bloom sufficiently. They bloom in every color except black, so you can choose the ones which work best for your room. Taking good care of them benefits not just for you to have its unusual, yet attractive flowers, but also the intoxicating fragrance in your room!